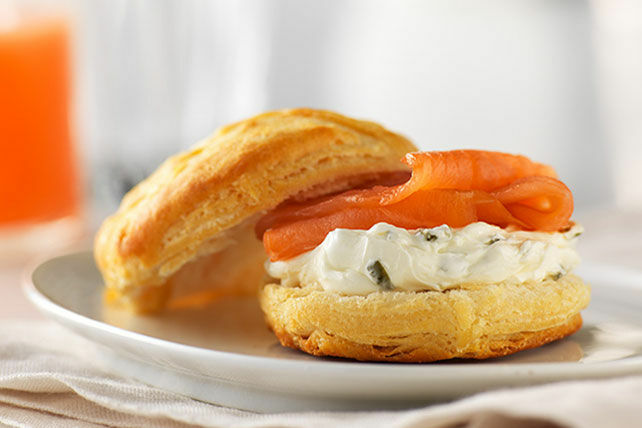 Our Smoked Salmon and Cream Cheese Biscuits are a must-try! This delicious spin on the classic combo of bagels with cream cheese and smoked salmon makes a great brunch recipe. Bake biscuits as directed on package; cool slightly. Spread bottom halves of biscuits with cream cheese product; cover with salmon and top halves of biscuits. Substitute mini bagels for the biscuits.